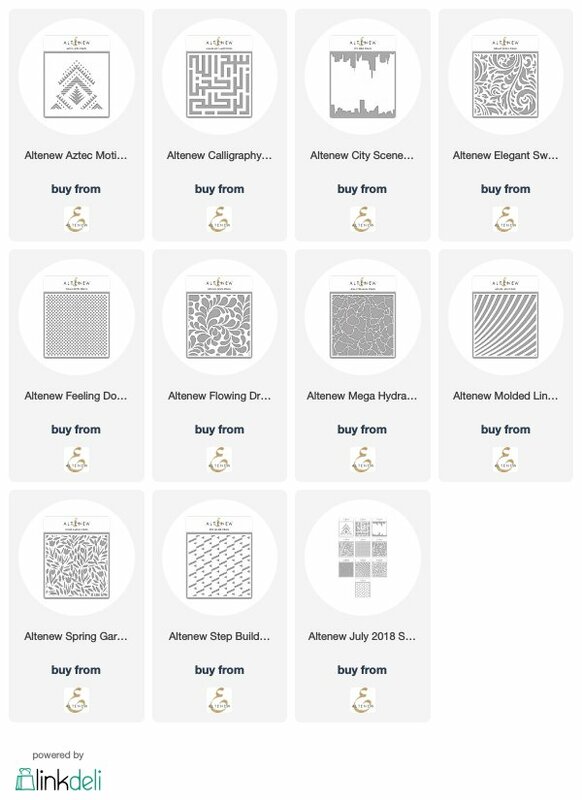 Altenew Stencil Release Blog Hop! Hello everyone! 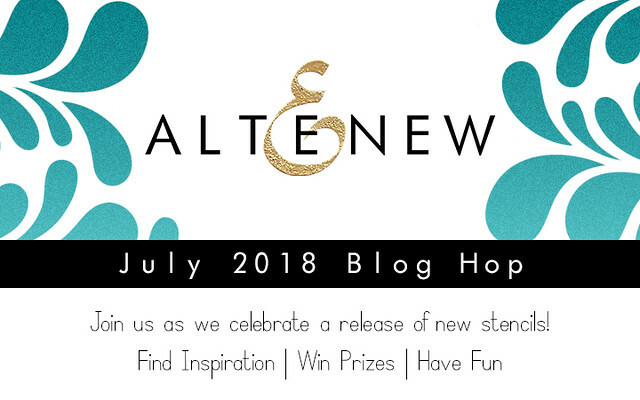 Welcome to Altenew Stencil Release Blog Hop. This is a stencil release from Altenew and there are 10 fabuous stencils released. I am so excited to be part of this release. If you have come from Lilith Eeckels ‘s blog, then you are on the right track on the blog hop. If not do not worry, I have all the participants of the blog hop listed towards the end of the hop. I have three cards to share with you today using the three new stencils. Over this month I will share more projects using the rest of the stencils from the release. 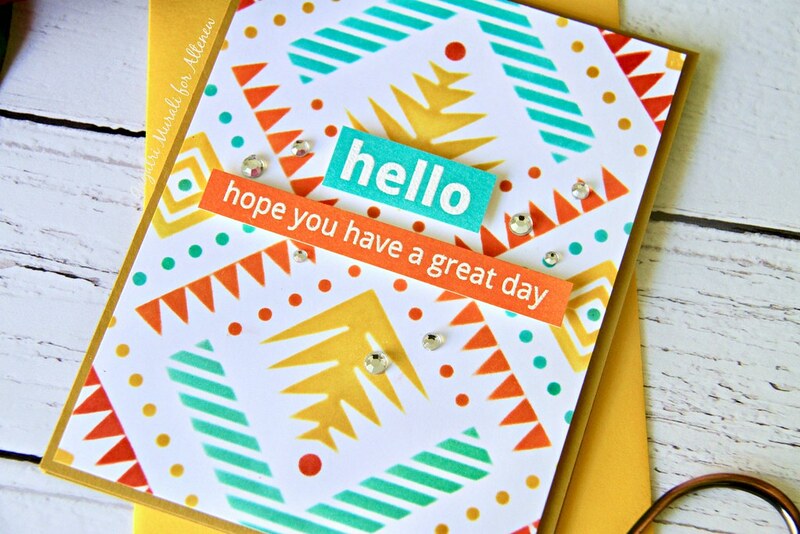 My first project is a bright, bold and colourful card using the new Molded Lines Stencil. I love this molded lines stencil because the lines are dramatic. Good size and curved adds to the drama. 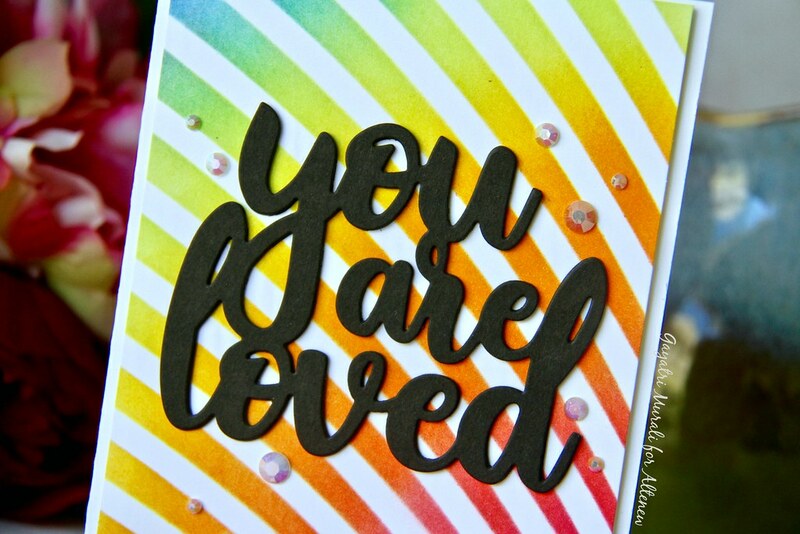 So I did simple ink sponging in rainbow colour to showcase the stencil and create the rainbow background for the card. I used distress inks here. Since the background is colourful, dramatic and showcases the stencil, I want the background to be the highlight of the card. Hence the sentiment is simple die cut stack of You Are Loved die in black. The contrast of black bold sentiment against the rainbow lines on the background is so good. I just added a few diamonds to complete the card. Here are some closeups of the card. All supplies used to make this card are listed below. The second project uses muted colours. On this card, I used the Elegant Swirls Stencil on the background. This stencil is very elegant as the name says. I did a lot of ink layering to create the background. The base of the card is kraft. I sponged distress inks in Tattered Rose, Worn Lipstick and Seedless Preserve on the card front. Then I place the Elegant Swirls stencil on top and sponged the same distress inks on the stencil. This time I sponged the inks a bit heavily. Then keeping the stencil in place, I also sprayed Altenew’s Iridescent Shimmer Spray over the stencil. I left the card to dry while I made the sentiment. 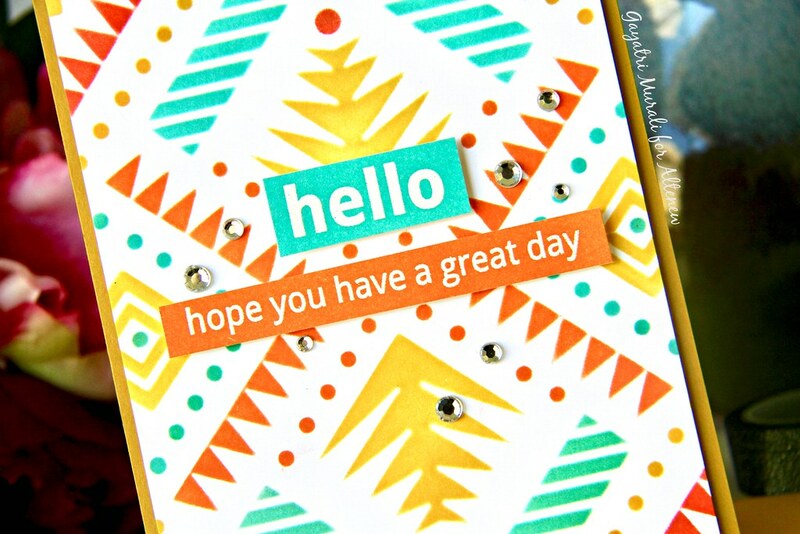 Sentiment is a stack of Mega Thanks die with the shimmer die cut on the top of the stack. I adhered this sentiment at an angle on the background panel. The secondary sentiment is from Label Love stamp set. I simple stamped the sentiment in black ink on white cardstock, trimmed and adhered below the large sentiment on the bottom right of the background using foam adhesives. Finally some rhinestones in the same colours as the background to finish the card. The final card today showcases my most favourite stencil from the release – the Aztec Motif Stencil. I absolutely adore this design. To get this background, I sponged Altenew inks on the stencil, moved the stencil, masked some area of the stencil and sponged inks again until I covered the entire background. I chose warm earthy colours as originally these motifs are hand painted using colours made using natural materials. So most colours used with these motifs are either black and white or earthy colors. The sentiment is from Quilled Elegance stamp set. I white heat embossed the sentiment on two strips of white cardstock and sponged the same inks from Altenew I used on the background on these strips thus coordinating with the background. I trimmed the background to 4’x5.25′ and mounted on a mustard coloured card base. I completed the card with some rhinestones. Here are the supplies used to make this card. Hope you have enjoyed my projects for the blog hop. These new stencils are amazing. I love them all. You will see more projects using other new stencils over this month. You next stop on the hop is to the gorgeous Virginia Lu. Here are the details of the blog hop. I am also giving away a $30 gift certificate from my blog. Make sure you leave your comment below by 10th of July. I will announce the winner on the 11th of July. Here are the list of all the designers on this blog hop. 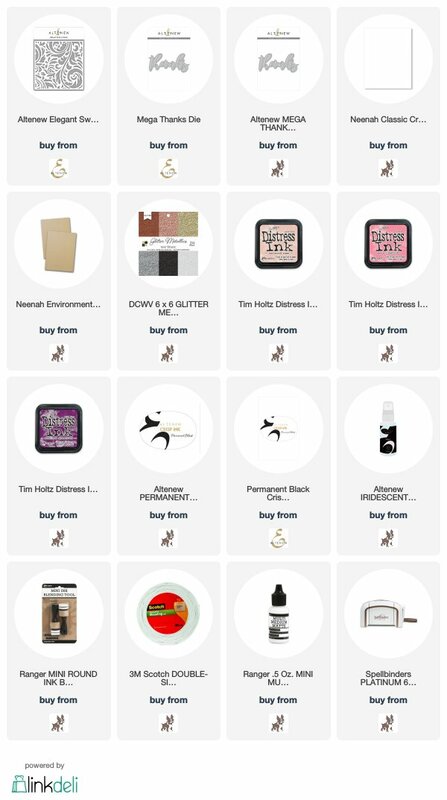 Here are all the stencils released. Your cards are amazing! Love all the colors! So pretty! The colors on the Big Thanks card are just amazing!!! I like the colors you chose for each of your creations. Fabulous cards! My favourite is Aztec motif card.The best card so far! I love that second card, the others are very pretty also! Great designs and techniques, thanks for sharing! These are such gorgeous vibrant creations!! Thanks for sharing! Oh that Elegant Swirls card!! PERFECTION. These are all amazing! I love the big text messages and the bright color! They are all so cheerful and bright! Your backgrounds are very oretty. Wow. Gorgeous cards. I love them all but the layering of the distress inks is perfect! I will have to try it out! Amazing cards! Love your ideas! STUNNING cards! I love the Aztec Motif stencil too, so beautiful!! So many beautiful stencils in this release. Your ink blending is gorgeous. Thanks for the Aztec stencil card as it’s very different from the usual themes and so fun! Beautiful cards, love all the colors and designs. You have used bright colors so perfectly. These are absolutely wonderful. You used just the right colors and technique for each card. All of your cards are really pretty, Great job! 3 wonderful cards … I love the possibilities of stencils … soft, crisp, textures … I’m taken by the city scene, step builder and elegant swirls! What beautiful cards from these stencils. The inspiration factor on this blog hop is off the page! I definitely want to add more stencils to my stash, starting with the large hydrangea and the city scenes from this release. Wow! All of the cards are so unique! Can’t pick a favorite! But, the thanks card was really outstanding! Amazing cards! You have made me fall in love with the Aztec stencil. Thanks! 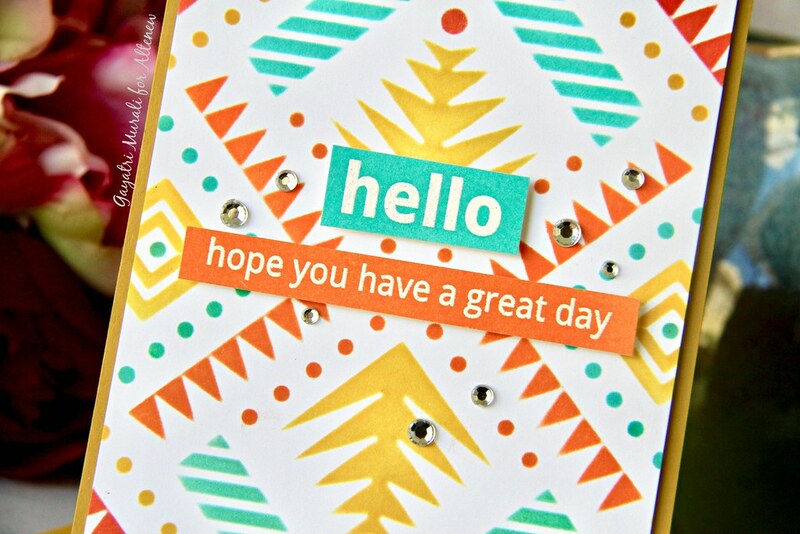 Gayatri, your die cut sentiments are stunning against the stenciled backgrounds. Also love the colorful Aztec card!! Your cards are stunning ! I love all three of them, they all have something special… they are all really fantastic creation ! 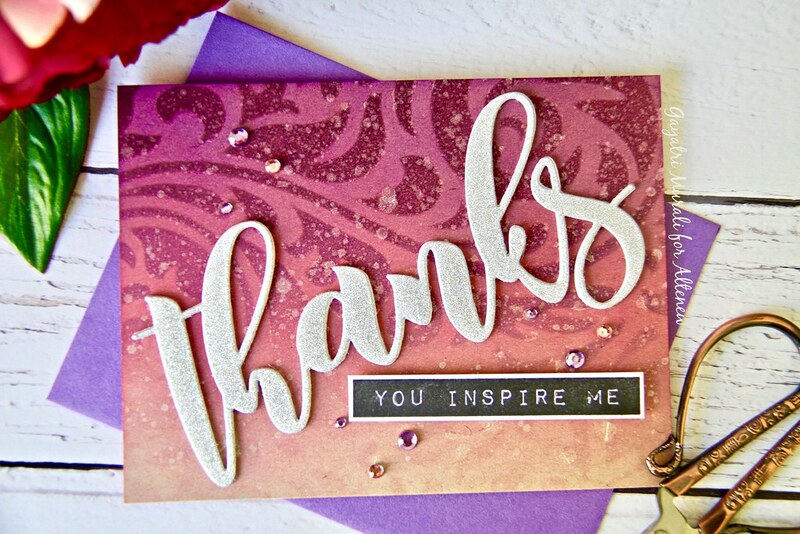 love how you’ve used these stencils – the ombre background on the “thanks” card is so pretty. Your card work is AWESOME! Another stencil into my already loaded cart because of your inspiration. For me, it is sometimes hard to see how a product will work until I see what others do with it. Seeing your cards make me really like the molded lines so much. Such dramatic background with that bold sentiment! Thanks for your inspiration! Love each one of your cards, but the second one is my favorite! These new stencils are simply awesome! Love your cards, especially the second one! The blended colors are gorgeous! These are beautiful! I love the shimmer spray. I think the Aztec Motif is my absolute favorite. I love what you did with it! Love all these cards, this idea are unique. Your cards are all just stunning! Now I even love this new Altenew Stencil release even more. All of your projects are gorgeous and bright! So happy that you are part of this blog hop, Gayatri! I absolutely love the second card! The colours you chose and how you chose to use the beautiful swirls stencil is so unique and leaves you with such a pretty card! Gorgeous cards. I am getting much poorer!. Love all the new goodies. Love your cards especially the Aztec Motif one. Oh my! Your second card is so gorgeous and elegant, beautiful! I thought the cityscape stencil was my favorite. After seeing your card perhaps the elegant stencil is my new favorite. 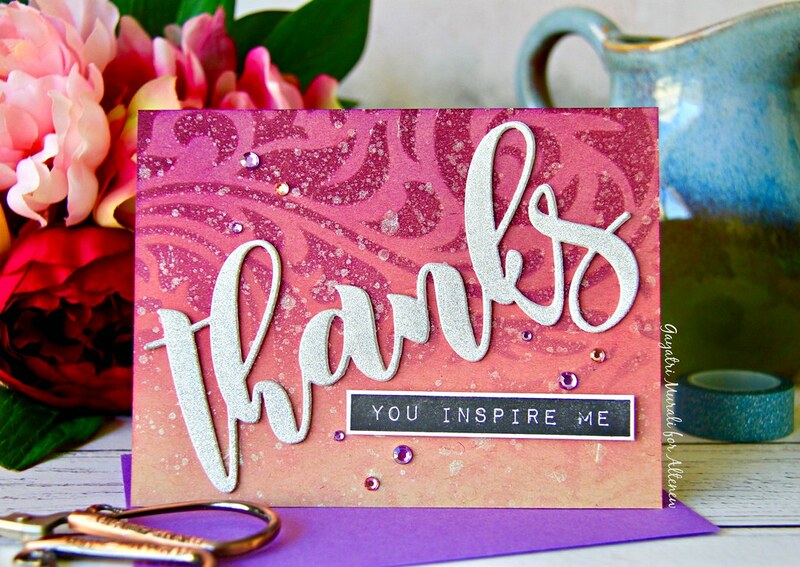 I’m a newbie at card making and this blog hop has given me so much inspiration. I’m so happy to have found you and the other bloggers – I’m looking forward to learning so much from you all! love the stencils and all the great ideas. thanks as always for sharing. love your pink card and the new stencils you used. Love bold black statements on colourful backgrounds! Your cards are fantastic. I have to admit, I have never blended distress inks on Kraft. I must try it as your card was stunning! Lovely cards! The colors and shading you achieved on the Elegant Swirls card are superb. Wow! Are of the card samples are just beautiful! I always enjoy visits to your blog. Pretty cards for this release. The three cards you shared are marvelous. I love how you created an entire background using the Aztec stencil, and the colors you chose. My favorite card was the molded lines stencil. The rainbow effect you got with it was terrific. Thanks for the inspiration. All three cards are vastly different in design and feel, with something so very wonderful about each! I love your thoughts about the Aztec design stencil card, relating back to how those designs were originally made, it makes it much more tangible and real. Wonderful release and gorgeous cards! Loved the elegant swirls card. So creative. Sooooooo creative! Great use of the stencils, love your color choices too! All your cards are fabulous! I especially like the colours you’ve used for the “Thanks” one. Such a great blog hop. So many diff ideas. All of your cards are so pretty, but I just love the elegant swirls red one. The background is so beautiful. 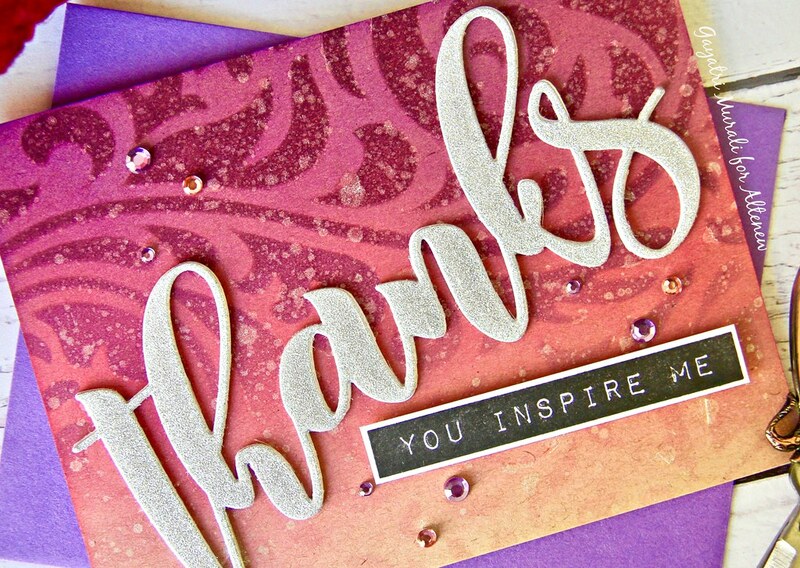 So many wonderful stencils, You did a fab job showcasing them, love the first card with the colorful background and the bold sentiment! thanks for the inspiration! 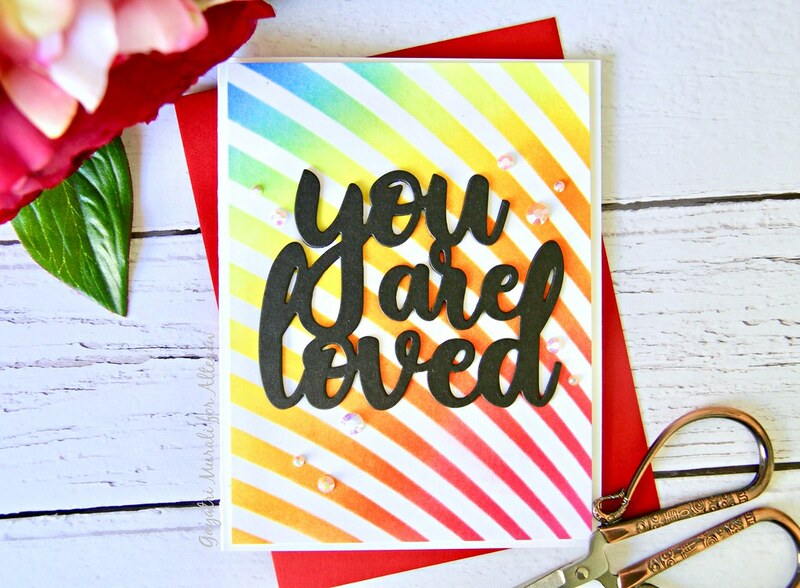 Love each of your cards from the happy rainbow colours with the Molded Lines, the perfect choice of colours for the Aztec stencil to the elegance & beauty of the Elegant Swirl stencil. I love your thank you card! Wow! 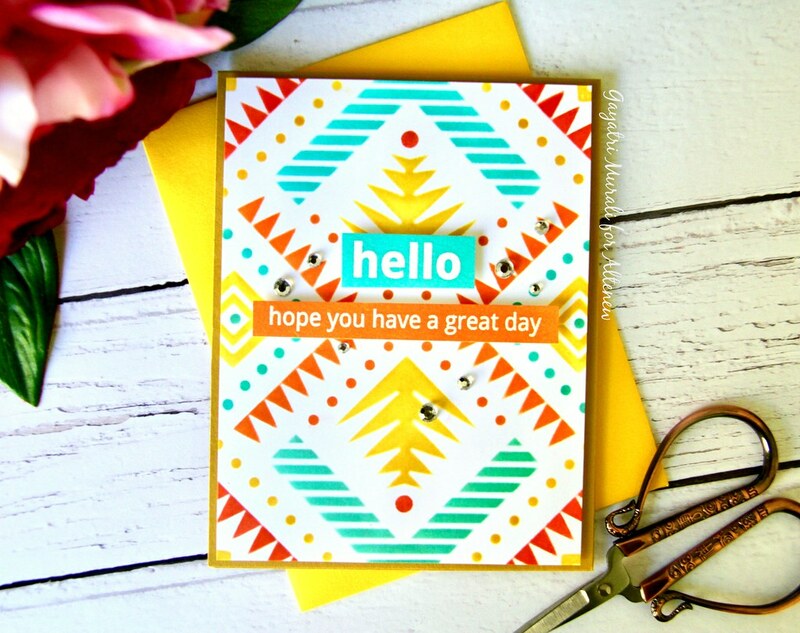 I fell in love with the Aztec motif you used on your card! I wasn’t too sure about it in the beginning! I also started following your blog! I really love how you used the aztec stencil. Loved the colors and nice design of the card. Such lovely cards using the new stencils! Loved your color choices and techniques too. Love the colors you chose! Absolutely beautiful! Amazing cards! 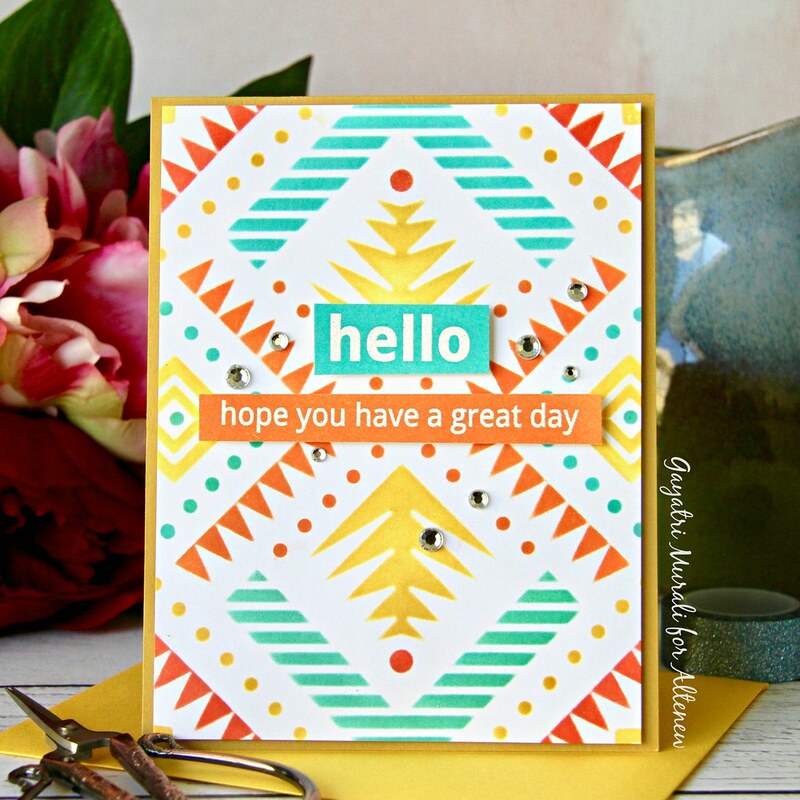 I love rainbow design of your first card, and the bright, earthy tones of the Aztec stencil background. The “Thanks” card with the berry colors is gorgeous! Your ink blending on the stencil is perfection! I love rainbow design of your first card SO PRETTY!! The “Thanks” card with the berry colors is Stunning! 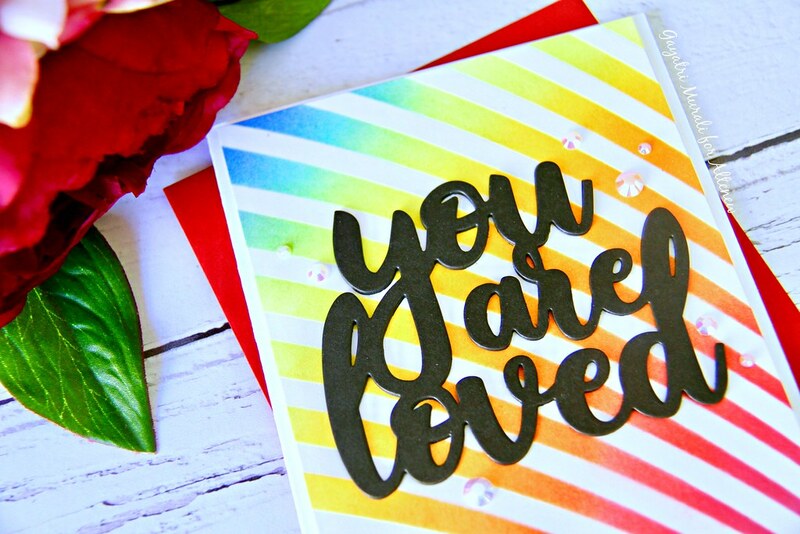 Stunning cards – I love how the bold black graphic looks on the rainbow stenciled backgrounds and the Thanks card is just gorgeous! 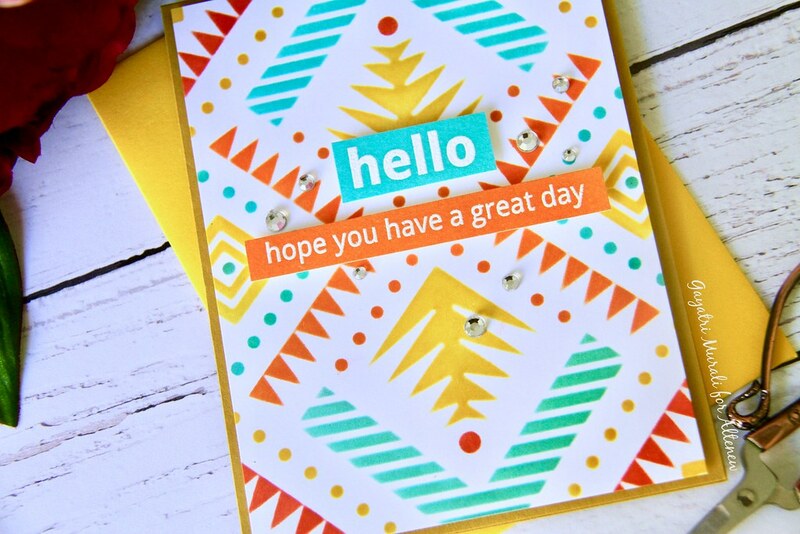 Love the gorgeous colors you used on all of your cards! 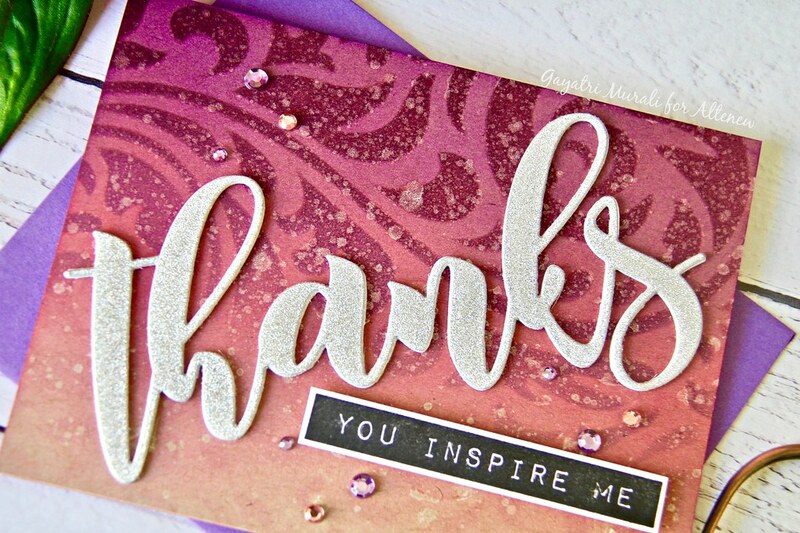 The rainbow stencil with the bold sentiment is so pretty but I also love the thanks card in the beautiful berry colors! Great job! Great cards! The last two are definitely my favorites. Different styles but I really like them both. Thanks for sharing! Your cards are so pretty! 🙂 Great job! Great projects. The Molded Lines stencil is my favorite from this wonderful release and I love that card. The rainbow card is so cheery! I love what you did with all of your cards. Beautiful! Beautiful cards! I love how you layer the ink on the kraft cardstock..It really make a unique and fabulous look. Pretty cards, very cool stencils! Your so clever with your stencil use and especially love the colours for the last card, reminds me of American indians for some reason, very beautiful and eye catching!! All your cards are just amazing! So many fantastic ideas to showcase these great new stencils! Thanks so much for sharing! Amazing cards! Bold, graphic, elegant – simply stunning! oooooh! luv the colors in your thanks card! Beautiful colors and stencil designs! 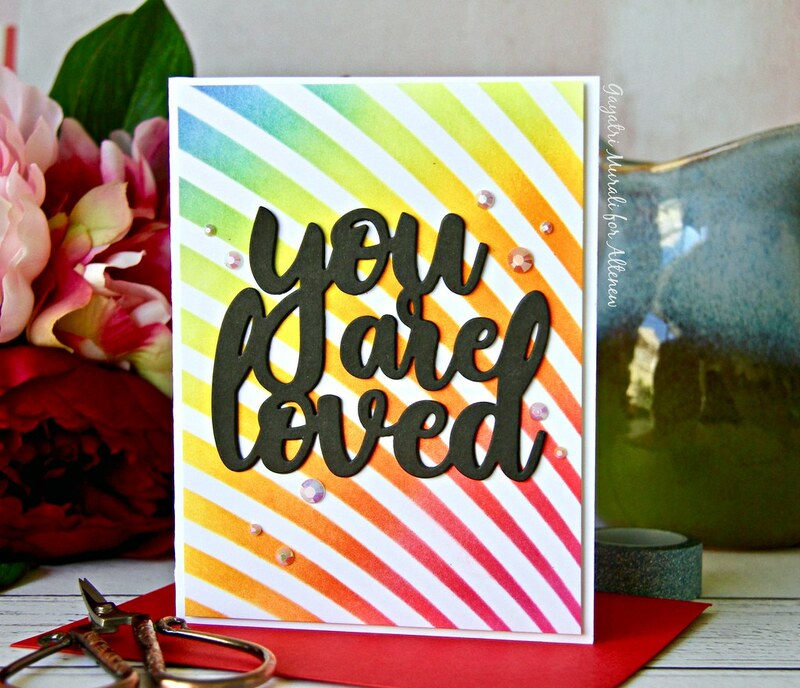 Love the rainbow colors on your first card! Such gorgeous cards. Love all your designs. Colorful, pretty and great design. Absolutely beautiful creations! My favorite is the Elegant Swirls. Your coloring is superb! Gosh, these are so beautiful cards!! Love the new release. And the inspiration cards are gorgeous! Fabulous cards especially that maroon background.